Dear Drew: Can I Set My Mile PR While Driving My Car Home? Drew Bosley is a senior at Homestead (WI) High School in Mequon, Wisconsin. A nationally ranked distance runner and top 10 finisher at both Nike Cross Nationals and Foot Locker Nationals, he has decided to inform a nation full of curious runners in their quest to understand life in a new feature that is the offspring of Dear Running. Enjoy. And so now I've decided to answer your questions about life and running. If my thoroughly-thought-through scientific answers don't bring you to the next level in your running endeavors, hopefully they can bring a smile to your face. With that in mind, put down that milkshake or Fortnite controller and listen up. Dear GRAYDON: If we are talking about walking zombies (most likely during the fall months, when zombies are more likely to ramp up mileage) then we should be doing 10K to marathon training. You are in no immediate danger, I think, but just be aware how far those zombies are tracking and whether they make one giant move on you. On the other hand, running zombies are a different animal: Only the fast will survive, so you will need to train extensively. You will need to do all-out mile repeats...carrying all your belongings. You are not allowed to wear spikes, and you definitely cannot warm up. Be prepared to be running in a pack and be willing to fight other runners for position. Elbowing IS allowed. I advise you to switch your mentality from "sit-and-kick" to "straight from the gun." When I say gun, I actually mean the first scream you hear. Part of me is worried about "championship style" racers. Don't be like Matthew Centrowitz. In a post-apocalyptic world scenario, you have no time for a casual 2 minute, 16 second opening 800 meters, be it the Olympic 1500 meter final, or your "run-for-your-life" scenario. Just remember ... if the chase pack catches you, you're dinner. For example, IMMINENT DEATH, I will give you my own experience. That 40 second last 200 meters I dropped at Arcadia in the 3200m last spring when 12 people passed me? That would have gotten me eaten for lunch. My advice: Train harder. Dear ANDY: Cory's last name is in fact "From MileSplit." From what I can tell, Cory is not a human. Cory was built in a laboratory and MileSplit has rolled out several versions of him. Their current version, Cory 3.5-Austin (currently a mid-update and not a full-update), is a very high functioning AI who happens to be a journalist. This fall, MileSplit will be mass producing the Cory 3.5-Austin edition to appear in a few states possibly near you, so do not be alarmed to see him at dozens of cross country meets all across the country at the same time. The 3.5 version fixed several bugs, including a strong affinity for nachos and randomly snapping his fingers at the end of interviews. If at any meet you notice Cory-3.5 acting erratically, he can be reset by rubbing the top of his head and whispering "Baby Cory go night-night." Be prepared for irrational laughter. Dear RYAN: I just finished the new rule book on GPS watch PRs. Let me fill you in on the guidelines. Garmin PRs count if they are done running downhill, on a bike, or if a better runner borrows your watch for the day. Not in cars (yet). You can also switch your measurement to kilometers and pretend your kilometer PR is actually your mile PR. This may confuse your teammate, who doesn't know the conversion and may actually THINK you are amazing. This also may impress a potential homecoming or prom date, assuming they are not a distance runner. Proceed at your own risk. Finally, your ARE allowed to use a car; however, it has to be a certified Fred Flintstone car. Just do what I say. 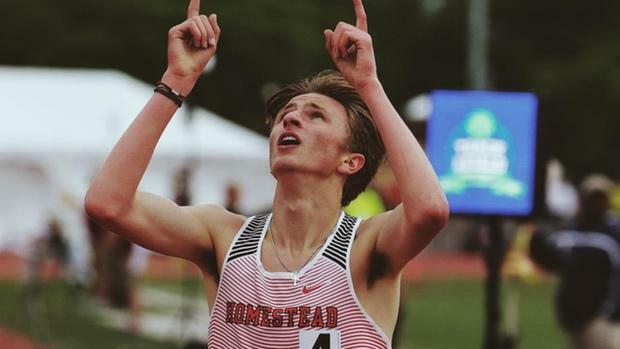 Dear KATELYN: Here is the MileSplit link to all of the boys in New York who have run faster than 4 minutes and 33 seconds for the mile. I know this is slim pickings, but maybe one of those boys can break it down on the dance floor. In your next cross country race, you should do a dance move after you cross the finish line. This will give you a chance to show everyone the light-hearted side of THE Katelyn Tuohy while you race. But, don't dance too well because then the boys will be intimidated from that, too. Why do I have to pee sooo bad before races, and then I only go for 5 seconds? We are worried about the freshmen, they won't wear short shorts. What can we do? Will I ever get a calf vein like the pro runners? How fast does one have to run to get a date with Colleen Quigley? Would Eliud Kipchoge break the 2 hour barrier for the marathon if a zombie was chasing him at 1:59:59 pace? Who would win in a boxing match: Matthew Centrowitz or Galen Rupp? What would Evan Jager look like if he was bald? Since running is a roller coaster of a sport, what would your roller coaster name be? If you reincarnate into a person one day so you can watch all the runners, how will I know it's you? Would you care if I will come up to you, gently rub the top of your head and whisper in your ear, "baby Drew go night-night"? This has been real life advice from Drew Bosley, and he has many more thoughts. Feel free to reach out to him on cross country courses with your own questions, although make sure you do it after the race. He's busy, OK!